How do I share my article with a group? How do I remove a collaborator? How do I add someone who is not on Authorea to my document? Authorea has a new powerful commenting framework built into the editor. Each document has comment bubbles to the right of the text that may be toggled to leave or view comments. Note: To comment on specific parts of the text, first highlight the text you would like to comment on. Next, select the comment icon to the right. Comments can be left privately or publicly by selecting the lock icon at the bottom right of the comment box. To leave an anonymous comment, select the eye icon at the bottom right. If your article is private and your comment is public the comment will only be displayed if you make your article public. Comments will be sent to collaborators via email as well as displayed in the right margin of the article. To turn off comment notifications, please follow these instructions. We are working on a number of powerful new features to make commenting ever more powerful. Curious to know what&apos;s coming next? 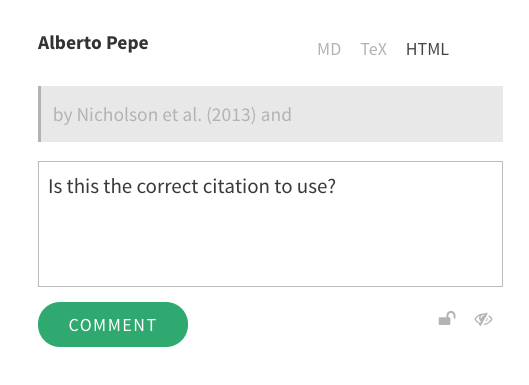 Better positioning of anchored comments, the ability to "resolve" comments, and the ability to tag ("@") collaborators. And more!